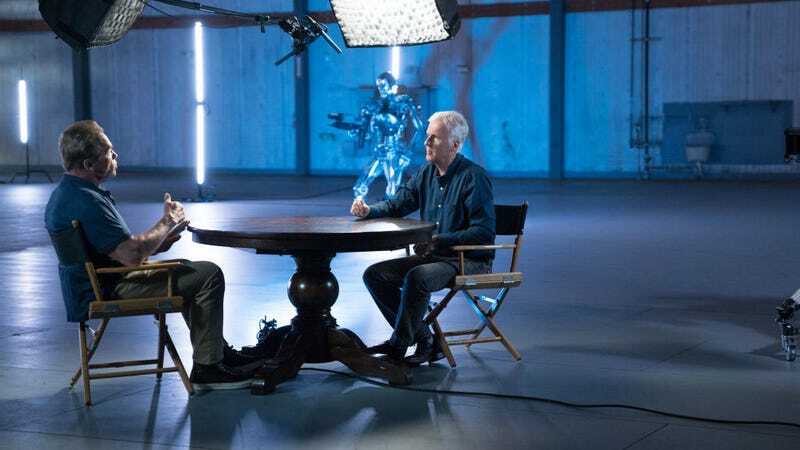 James Cameron interviewing Arnold Schwarzenegger on his new AMC show. James Cameron has a lot of thoughts on science fiction. This shouldn’t be a surprise, considering he made The Terminator, Aliens, The Abyss, and Avatar. But in a new series debuting tonight on AMC, he and some friends will be exploring the genre in a much deeper way than those films ever could. Cameron said settling on those topics was one of the hardest parts of putting the show together. Once it happened though—through interviews with the likes of Steven Spielberg, George Lucas, Ridley Scott, Guillermo del Toro, Christopher Nolan, Arnold Schwarzenegger, Will Smith, and Sigourney Weaver—Cameron and his team aimed to give an insightful and well-informed, but also broad look at each topic. Cameron interviewing Guillermo del Toro, who Cameron said knew more about all of this than anyone. In large part, that broader view comes from not just talking about the modern scifi movies which have dominated the box office in the past decade, but also Cameron’s star power. He was able to use his influence and relationships to bring some truly huge names on the show, not all of whom were eager to appear. Though all three hours won’t be on the show, there is a companion book with many of the interviews fully transcribed. Among the topics both on the show and in the book will surely be Cameron’s insistence that because of the ways the modern world has changed, creating new science fiction is harder than ever. Star Wars creator George Lucas is among the interview subjects on Cameron’s show. For Cameron, next on the horizon are four Avatar sequels as well as a new Terminator film, which he’ll produce. And it’s through that Terminator film that his thoughts on how to approach the problem of creating new science fiction in the modern world really shine through. And if it doesn’t, the Story of Science Fiction definitely will. The show airs Mondays at 10 pm, beginning tonight on AMC.